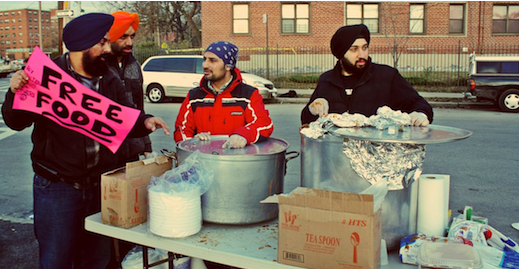 The Superstorm Research Lab, a mutual aid research collective in New York City, is collecting and hosting resources for those studying Hurricane Sandy and its aftermath. We invite you to submit any data you feel would benefit other researchers, Long Term Recovery Groups, policy makers, and groups engaged in rebuilding. Available resources currently include interviews, tweets, public reports, canvassing data, volunteer group meeting minutes and transcripts, sermons conducted immediately after the storm, and more. While our current data is centered on New York City and New Jersey, we welcome all types of data, both qualitative and quantitative, for all locations. This data resource is part of SRL’s larger mission of promoting mutual aid within research communities. Please email mliboiron@mun.ca with data or questions. Page from The Building Resiliency Task Force report by the Urban Green Council. Available on SRL’s page for public reports. Spring Break is almost here! Are you looking for a way to promote rights and make a difference over Spring Break without leaving NYC? Volunteer with NYU Law’s Global Justice Clinic! The Global Justice Clinic is seeking volunteers, preferably Spanish speakers, to assist in a study on rights violations of construction workers in Sandy-affected areas of NYC. The project examines the experiences of construction workers on issues of job security, safety, fair pay, discrimination and access to adequate housing and healthcare, in order to collect valuable data to support the advocacy work of local community organizations in the fields of labor and immigrant rights. Over Spring Break, volunteers will receive 2 days of training (March 17–18) in conducting interviews with participants. Then they will travel in pairs to Sandy-affected areas in NYC to survey construction workers on-site for 2–3 days (between March 19–23). Each interview will take approximately 30 minutes and survey teams will record answers on PDAs. The data will be analyzed by us and our collaborators and we will share our findings with you so you can see what your volunteer efforts helped produce. For more information or to express your interest, please contact: Anji Manivannan (am4800@nyu.edu) or Julia Freidgeim (jf2544@nyu.edu). One of the major dilemmas facing contemporary urban governance and environmental action in the United States is the mismatch between inherited political boundaries and emerging sociospatial urban realities. This project investigates what impact an event such as Sandy can have on such structures. The common assumption is that a heroic policy, NGO, or popular effort will be needed to transform inherited structures to overcome these mismatches. This project instead investigates what impact an event can have on such structures. In Sewell’s (2005) terms, events are the fateful collective contingencies that interrupt the reproduction of structures. In the literature on crises and disasters, this is a familiar way to understand the unexpected and transformative impact such events can have on “business as usual”, and this project applies these insights to the impact of Hurricane Sandy on the structure of urban politics in the New York City area. This paper is based on preliminary research with the Superstorm Research Lab collective. Based on interviews with policy actors, NGOs, first responders, and residents of affected areas, we ask how Sandy has potentially restructured patterns of governance and action based on stakeholder understandings of critical processes following Sandy. 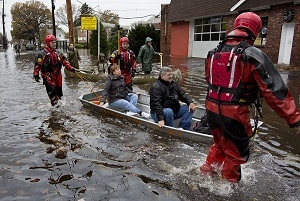 Hurricane Sandy had drastic impacts on 29 October, 2012. 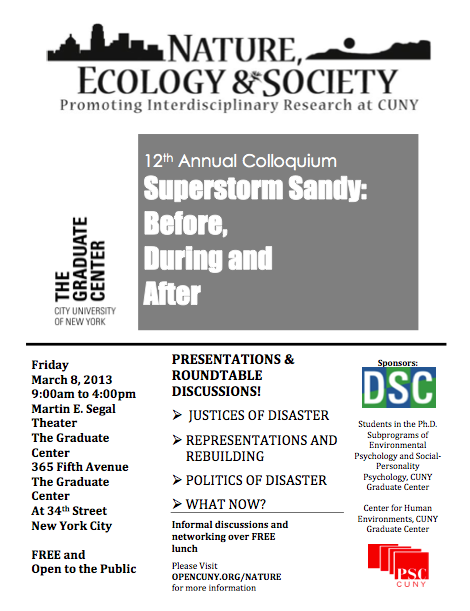 This year’s Nature Ecology Society Colloquium is intended to open up a conversation around Hurricane Sandy. We recognize that politics play a part in this conversation, that there are complex social and environment justice issues that have and need to be understood, and that there must be a rebuilding effort that is sensitive to all of these aspects. We hope this colloquium can be a space where presenters will openly interrogate these and other issues. The Nature, Ecology and Society Network is the City University of New York’s (CUNY) Interdisciplinary Network for researchers, activists and other colleagues whose work is at the intersection of Nature Ecology and Society. Trade unionists, community leaders and United Nations agency and national delegation representatives are invited to a special meeting to network and discuss critical disaster preparedness, response and recovery issues. In the wake of Superstorm Sandy, this is an opportunity to share experiences, lessons learned and best practice proposals for solutions. Your views are important. We look forward to having you join in the discussion on how we can strengthen professional expertise, public services and community capacity for better disaster resilience. This is not an SRL event. Superstorm Research Lab will be presenting some of our preliminary findings at CUNY’s Nature, Ecology and Society Colloquium. One of the major dilemmas facing contemporary urban governance and environmental action in the United States is the mismatch between inherited political boundaries and emerging sociospatial urban realities. This project investigates what impact an event such as Sandy can have on such structures. This paper is based on preliminary research with the Superstorm Research Lab collective. Based on interviews with policy actors, NGOs, first responders, and residents of affected areas, we ask how Sandy has potentially restructured patterns of governance and action based on stakeholder understandings of critical processes following Sandy such as contamination, climate change, debt, and governance. Schedule and other details to follow. NYC’s Post-Sandy Recovery: How’re We Doin’? Three months after the ravages of Superstorm Sandy, this program brings together government and civic leaders to both report on the status of the recovery of the New York City region and to discuss the effectiveness of the recovery efforts. The session will provide an opportunity to evaluate housing, neighborhood and open space clean-up and rebuilding initiatives. Last October 21st, AIANY’s Design for Risk and Recovery Committee fielded a similarly-constituted panel at the Center for Architecture to address the question: “After Disaster: How Does New York Plan to Recover?” Only eight days later, Hurricane Sandy delivered a natural disaster that has given New York an unprecedented challenge to the disaster-recovery systems that were described. How well do you think they worked? What now? DfRR has become the center of the Chapter’s focus on disaster awareness and preparedness. It is a full-spectrum committee comprised of architects, planners, landscape architects, engineers, and related professionals – a source for information, discussion, connections, and the most advanced thinking on risk, mitigation, and resilience. Particpants will have the opportunity to make contributions to the Mayor’s Fund to Advance New York City to support Superstorm Sandy relief efforts.The Mayor’s Fund retains no administrative fee, and one hundred percent of donations are being dispersed to relief efforts and organizations. Funds will support immediate aid needs – including, food, water and hygiene supplies – as well as long-term relief and restoration. 131 W 25th St btw 6th & 7th Aves. 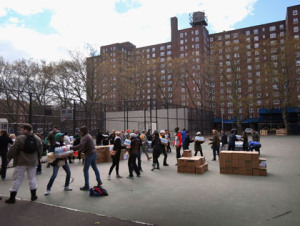 The newest hardship Sandy victims in Manhattan hotels are facing is eviction into homeless shelters. The agency that the city contracted to case manage victims is BRC, the group that usually picks up chronically homeless people from the streets and puts them in shelters. They have actually offered no help to Sandy survivors — they probably don’t even know anything about low income stable housing. They have been treating people extremely rudely and threateningly. Now they are systematically telling people they have to leave their hotel (before their previously given check out dates) and go to shelters, one by one. No one knows for sure if they are initiating this tactic, or if it is the hotels or the city. So far 3 families have been removed. This leaves the families in yet another borough where their children have to change schools again, where they are treated like prisoners, and where the environment is often unsafe. Others are planning to resist removal. A campaign to notify politicians and the press is underway, although that is probably useless given their previous unresponsivenes. Is Sandy the New “Normal”? From Hurricane Sandy to the devastating effects of fracking, the exploitation of our environment is driving outcomes like climate change and increasing numbers of “natural” disasters. Join us in a discussion with Chris Williams, author of the highly acclaimed book “Ecology and Socialism” about the man-made factors contributing to these unsustainable changes and how activists can organize for a different kind of society that prioritizes the sustainability of our environment. The Nature, Ecology and Society Network is the City University of New York’s (CUNY) Interdisciplinary Network for researchers, activists and other colleagues whose work is at the intersection of Nature Ecology and Society. We aim to continue the tradition of creating a space for interdisciplinary conversation at NES2013 by requesting proposals from CUNY and allied Students, Artists, Activists, Designers, Journalists, Musicians, Performers, Film and Video Makers, Humanities Scholars, and Life, Natural, Physical and Social Scientists. NES 2013 invites proposals for two kinds of presentations: Oral Presentations (15 minutes followed by 5 minutes for questions) describing scholarly, activist, or volunteer work relating to Hurricane Sandy, and Panel Presentations (45 minutes followed by 15 minutes for questions) of three or more presenters addressing Hurricane Sandy related issues from multiple perspectives and/or methodologies. Oral Presentation Proposals: Please include your name, project title, affiliation(s), and an abstract (100 words) outlining the presentation. Panel Presentation Proposals: Please include the names of all panel presenters and their affiliations, a panel title, individual presentation titles, an abstract from each presenter (100 words), and a rationale (100 words) for the panel discussion. Please also choose a panelist to serve as the contact person and please provide their contact information. All proposals should be submitted to the NES 2013 RFP online form. Following the selection process, applicants will be notified by February 14th. Due to time and space constraints, we may not be able to schedule every submission. Please contact natureecologyandsociety@gmail.com with questions. NYCHA and the Hurricane: Public housing learns from Sandy… What’s the plan for the next big storm? The wrenching experience of thousands of New York’s public housing residents following Hurricane Sandy revealed vulnerabilities of physical structures and human services. Volunteers, tenant associations, social service providers and NYCHA technicians all stepped in to do what they could through the worst of the aftermath. What did we learn? What about next time? What will a carefully planned and managed disaster response look like in New York City’s low-lying, low-income neighborhoods? A free 3-day gathering of workshops, panels, concerts and performances to unite for a more equitable and sustainable rebuilding in Sandy’s wake. The format revolves around workshops moving towards creating a collaborative Sandy policy statement from the grassroots. Most of the groups or individuals invited as “speakers”are actually facilitating workshops or trainings, centered on the 5 themes, focused on drafting a policy report by the end of the Summit that would be edited afterwards and released. It was the organizers’ intent to insist on horizontal facilitation of each meeting. The panel discussions previously scheduled will be restructured into a more horizontal format. There are 7 panel discussions planned to date: “People Powered Relief, Mutual Aid and the State”, “Occupy Sandy: A report-back”, housing panel, education panel, environmental health and wellness, labor panel and an allied organizations panel. There are 24 workshops/groups planned; 7 slots for speakers; 10 resource circles; and 12 training sessions. For more information or to register, see http://summit.peoplesrecovery.org/ and register here.